Many publishers have been duped by fake peer reviews, which have brought down more than 600 papers to date. But some continue to get fooled. Yeah, we’re not exactly sure what happened here, either. SAGE gave us a little extra clarity — but not much. SAGE is no stranger to the damage caused by fake reviews. In 2014, one of its journals busted a “peer review and citation ring” that took down 60 papers, and prompted the resignation of Taiwan’s education minister. The following year, it retracted 17 more papers from five different journals, all affected by faked reviews. So how did the latest papers escape the editors’ notice? SAGE raised queries over the peer review for the special collections in May 2017 after similarities in some peer-review reports were detected. Supported by data from Clarivate and ScholarOne, SAGE launched its own investigation and on the basis of this sent all papers out for a second round of independent reviews. She said, “two reviews for a paper in the special collection recommended including the exact same set of citations.” (In 2012, we reported that Elsevier’s peer review system had been hacked, resulting in some faked reviews; we obtained two reviewer reports that suggested citing papers by the same author.) After the second set of reviews, ten of the articles were retracted. No author misconduct was detected. SAGE is firmly committed to carrying out robust peer review and reacting thoroughly investigating any cases of irregularity. we are working in consultation with the journal’s editors and authors to ensure that SAGE’s expected rigorous standards of peer review are met across the board and in line with industry guidelines. This means, as with all of our journals, a continuous review of practices and conversations with our academic partners to support them through peer review and any necessary changes to peer review practice. The guest editors of one of the special issues — “Advanced control and analysis of mechatronics systems with modelling uncertainty,” published November 2016 — are Jianyong Yao, Nasim Ullah, Zheng Chen, and Weichao Sun, based at Dalhousie University in Canada, Nanjing University of Science and Technology in China, Harbin Institute of Technology in China, and City University of Science and Technology in Pakistan. We contacted them but haven’t heard back. Hongliang Li, Jiangwei Chu, Jialu Li, Pengfei Cui, Zhanzhong Wang (2017). Energy recovery data characteristics extraction of flywheel energy storage control system for vehicular applications. Advances in Mechanical Engineering, 9(4). First published April 18, 2017. Cited three times. Dapai Shi, Liang Chu, Jianhua Guo, Zhanzhong Wang, Ruijun Liu (2017). Energy control strategy of plug-in hybrid electric vehicle based on pattern recognition. Advances in Mechanical Engineering, 9(3). First published March 10 2017. Cited three times. Zhiyan Dong, Shun’an Liu, Yongming Yao, Linqiang Hu, Chunxue Wang (2016). Flexible performance design for the H∞ loop-shaping control based on the linear matrix inequality approach: Application to the coaxial rotor helicopter. Advances in Mechanical Engineering, 8(8). First published August 3, 2016. Cited once. Cheng Liu, Guowei Cai, Deyou Yang (2016). Design nonlinear robust damping controller for static synchronous series compensator based on objective holographic feedback–H∞. Advances in Mechanical Engineering, 8(6). First published June 21, 2016. Cited once. Huann-Keng Chiang, Chun-Chiang Fang, Feng-Jui Hsu (2016). Robust variable air speed control of a nonlinear fan system based on backstepping sliding mode control techniques. Advances in Mechanical Engineering, 8(6). First published June 2, 2016. Cited twice. Yunjiang Cheng, Xiangyang Xu, Shuhan Wang, Yang Liu (2016). Generic control flow for the four types of clutch-to-clutch shifts. 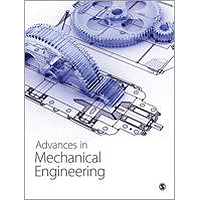 Advances in Mechanical Engineering, 8(5). First published May 20, 2016. Cited twice. Yuanjin Yu, Zhaohua Yang (2016). A semi-physical simulation platform of attitude determination and control system for satellite. Advances in Mechanical Engineering, 8(5). First published May 12, 2016. Cited twice. Gang Shen, Yu Tang, Jinsong Zhao, Hao Lu, Xiang Li, Ge Li (2016). Jacobian free monotonic descent algorithm for forward kinematics of spatial parallel manipulator. Advances in Mechanical Engineering, 8(4). First published April 24, 2016. Cited five times. Huaxiang Cai, Yongmei Huang, Tao Tang, Qiang Wang, Junfeng Du, Tong Zhang (2016). Double speed loops control for high-precision position tracking of position-controlled actuators involving a harmonic drive reducer. Advances in Mechanical Engineering, 8(3). First published March 15, 2016. Cited once. Ye-Wei Zhang, Guo-Qing Jiang, Bo Fang (2016). Suppression of panel flutter of near-space aircraft based on non-probabilistic reliability theory. Advances in Mechanical Engineering, 8(3). First published March 15, 2016. Cited once. The peer review process at this journal is anything but rigorous. I wrote to SAGE and the editorial board of AME in October 2017 about a case of blatant copy&paste duplication. I’ve reminded them regularly since then. I have yet to receive a substantive reply. The article with DOI: 10.1177/1687814017724702 represents plagiarism and serial/duplicate publication. It must be retracted forthwith, in accordance to the journal’s membership in COPE. Next, the problem is physical nonsense. The authors add random fractional derivatives and modify a boundary condition from the textbook version of this problem. Is Advances in Mechanical Engineering a journal that specialized in publishing homework problems? 1) DOI 10.1007/s11012-011-9467-4 changing one BC to be proportional to t.
2) DOI 10.1007/s00033-009-0038-7 changing a fraction on the derivative, one of the BCs, and from annulus to cylinder. 3) DOI 10.1016/j.camwa.2008.07.003 again, change one of the BCs. 4) DOI 10.1063/1.3694982, same as 2). 5) DOI 10.2202/1542-6580.2620 same as 3).